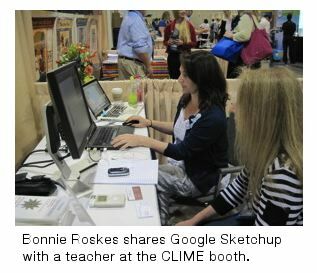 CLIME Math 2.0 NCTM meeting Heads Up: Where are the bloggers? 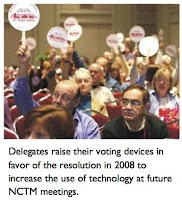 Since CLIME always tries to bang the technology principle drum loudly enough so that the NCTM movers and shakers (i.e. the Board of Directors, conference planners, etc.) 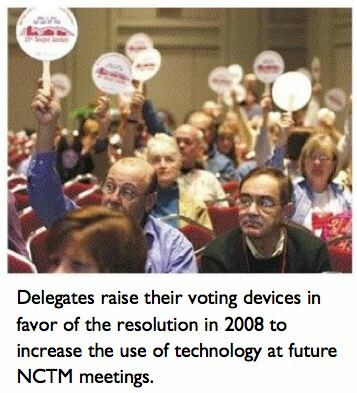 don't take it for granted, every year I do an analysis of the technology related sessions at the annual meeting to see if there is evidence of groundswell for the use of emerging technologies and in particular Web 2.0. To get a preview of what might be happening next April, I first investigated the goings on at the Baltimore Regional meeting via a cool, web 2.0-like online program book. (In Baltimore there were 226 sessions compared with 672 in Indianapolis.) But before I got a chance to plunge into it, I was red-flagged by a blog entry written by Sean Sweeney - a math teacher and blogger from Philadelphia - who shared his experience of the conference at Sweeney Math. Here’s a snippet from his October 23rd 2010 post. 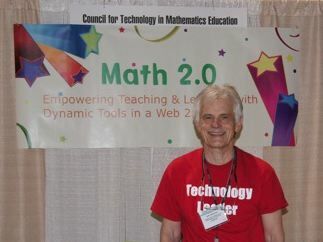 "If I had to choose one thing that stood out that I learned from NCTM it's that a ridiculous number of math teachers are completely unaware of the online math teacher community." Sean and Kate are not standing idly by. They are collaborating to produce a welcome page for folks new to the world of math teacher blogging. For details and how you might be able to help, see Sean’s blog post that includes a link to a survey he is doing. I hope you will support Sean’s effort to compile some great examples of the collaborative world of Web 2.0 and how it informs and inspires participants to be more creative, effective teachers. I too am interested in upping the ante on awareness of the online math educator world. 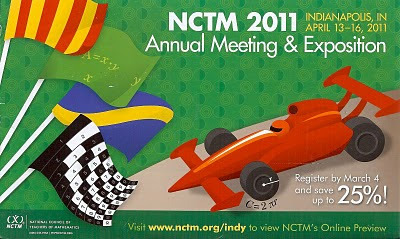 For that reason CLIME will once again be evangelizing the merits of Math 2.0* from our booth in the Exhibit Hall in Indianapolis. One of the perks of being an affiliate group is that NCTM makes it possible for CLIME to have a booth at a discount. Last year I helped Dan Meyer attend the conference and he energized our effort with some great blog entries. (As I'm writing this I noticed that he added a new one yesterday!) We hope to do even more at the big show conference next year. Here’s my wordle and chart of key technology related tags. 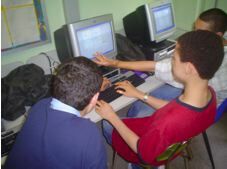 technological use in math education it makes sense that that the key word technology dominates. I thought about downsizing the proportional scale to make it more readable. 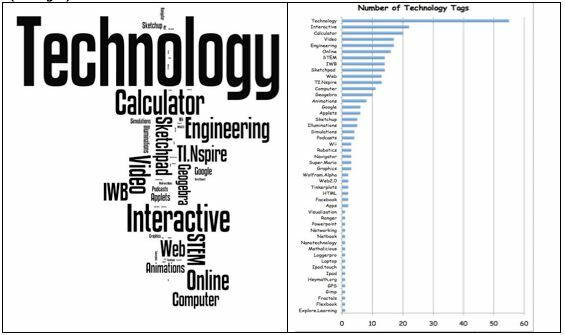 Instead I removed the word technology to get a better sense of the types of technologies that will be discussed. =>TI’s calculators continue to dominate the field. =>Geometer’s Sketchpad leads the pack of software programs that are specifically mentioned. =>Geogebra - the open-source competitor of GSP - is catching up. =>There’s definitely more mention of relevant websites and online references than in previous years. As far as Web 2.0 is concerned, there are only three sessions that mention it. Here are the titles with links to their descriptions. 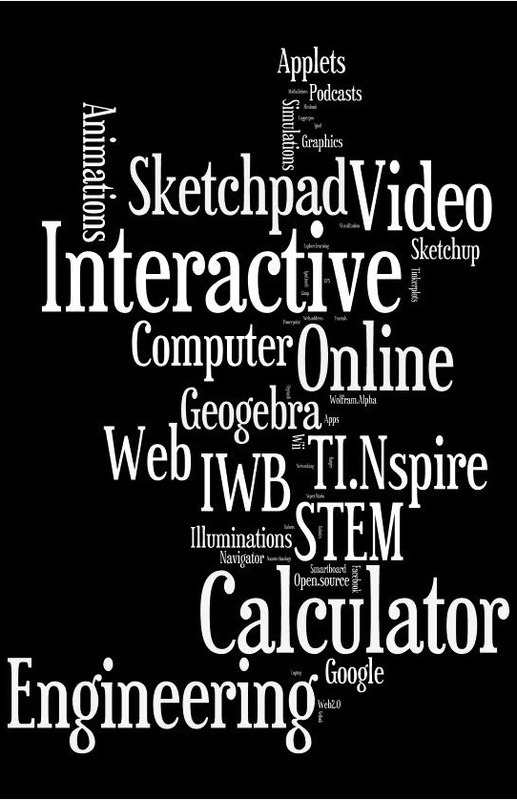 creative projects using free Web 2.0 tools. along with assessments differentiated by learning styles. 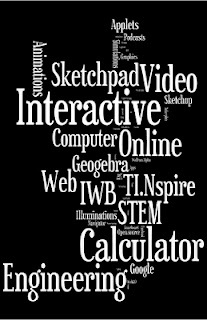 Web 2.0 tools such as online models and simulations. No mention of math blogging at all in any of the 672 session titles or descriptions. 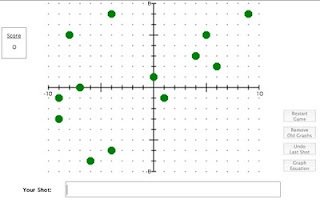 Though I do know that Karim Logue (Session #551) is a blogger who recently participated in a recent Math 2.0 Elluminate session. conference by commenting below or sending me an email. If you are presenting and wish to share more info about your session and make it available online we can post that for you on a website I will be creating. 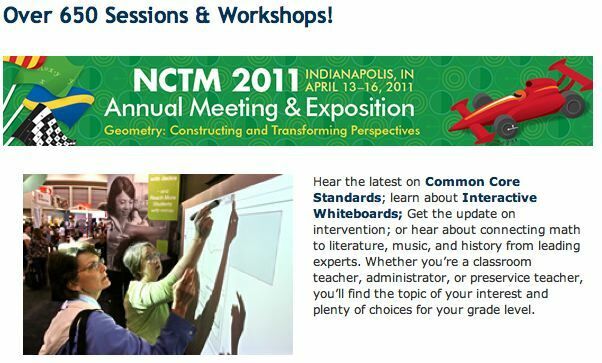 Currently NCTM's session listings do not offer you a way to post resources. 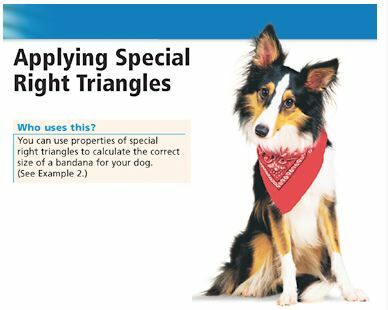 You can also create your own more dynamic description on our Wiki site (NCTM Online - The Unofficial NCTM Member Network). 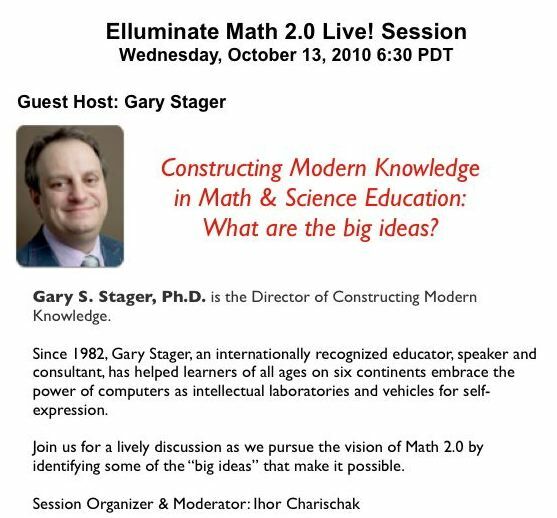 Our goal is to get more math teachers aware of how Web 2.0 and in particular math blogging is changing the face of math education. The campaign begins now. Stay tuned to this blog for more updates. 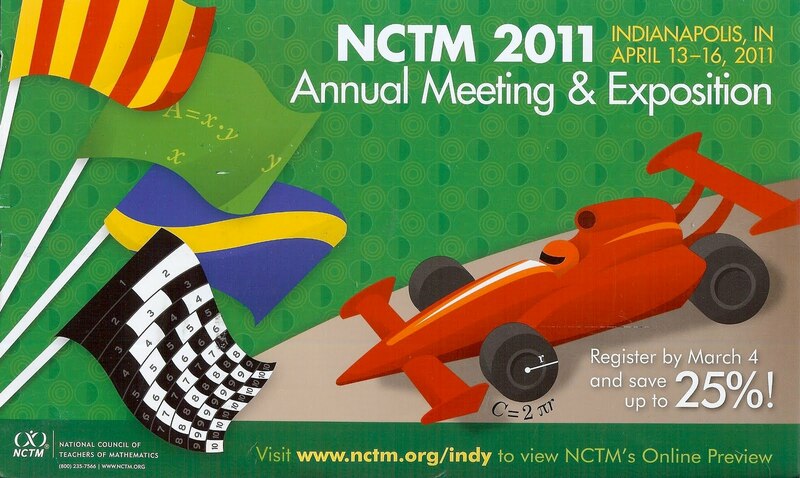 I just got this postcard in the mail promoting the upcoming annual 2011 NCTM Conference. Notice that there is some math embedded in the image. I can see four. Can you find them all? Of the four only one is "real." The others I would argue are candidates for being pseudocontextual. * Do you agree? 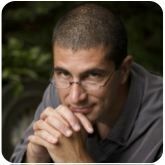 *See Dan Meyer's blog entry regarding pseudocontextualizing in math especially if you haven't heard of Dan Meyer who has captured the math blogging online world by storm. Is there a natural path to formulas? 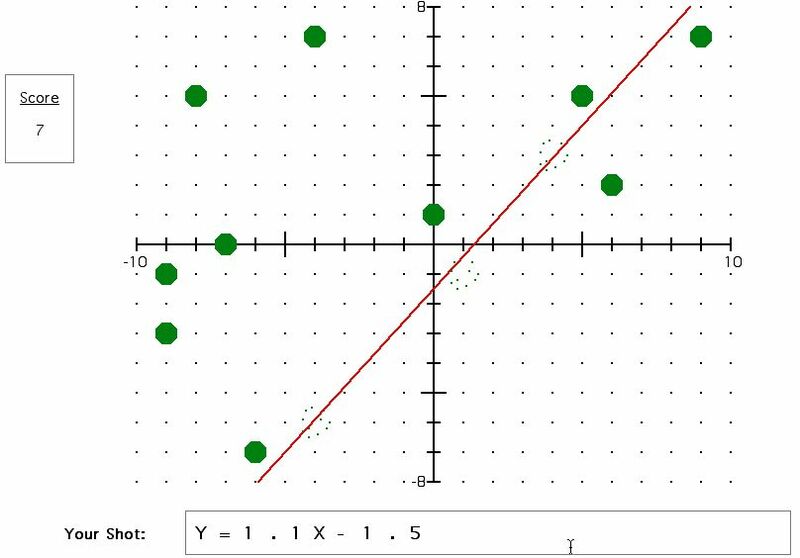 In other words, once your students get a handle on finding slope from the graph, how do you get the students to use the formula exclusively? Dan said that his students will stick to the “lower level” skill of counting squares on grid paper to determine the rise over run and resist using a more efficient method where they can just plug in numbers into a formula. For example, here is a typical problem which expects you to use the slope formula. 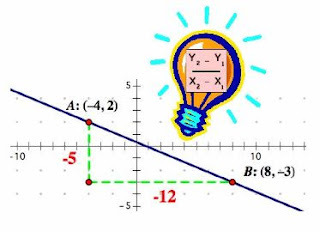 Find the slope of a line that passes through point A:(-4, 2) and B:(8, -3). 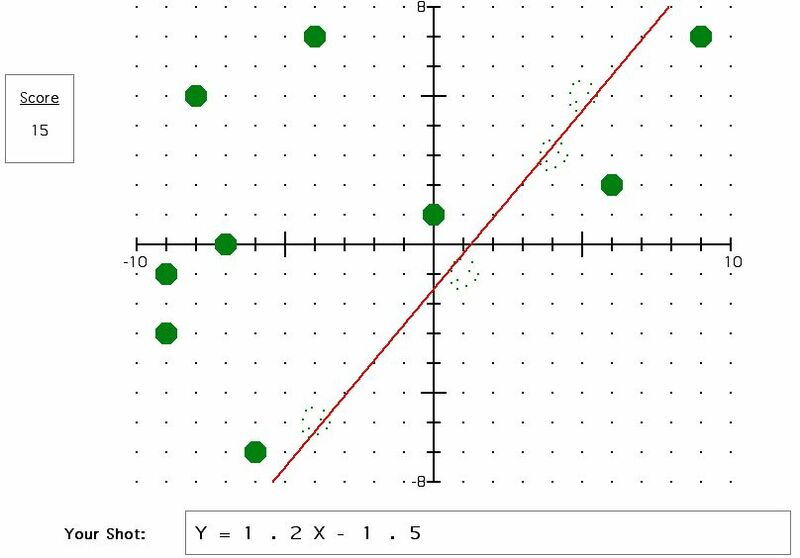 The more intuitive and concrete approach is to plot the points and draw the line first, then count the units for rise over run and get the slope that way. 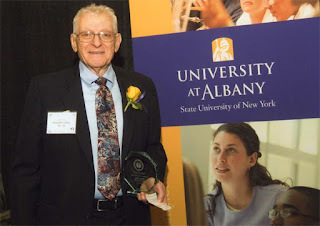 But Dan wants his students to use the x and y coordinate values of A and B and substitute them into the slope formula to get 2-(-3)/(-4-8) equals -5/12 answer. How do you motivate that? Dan answered his own question in response to this question posed by Colin: "Do any of your students start asking you for the shortcut before they get involved in the problem?" Dan said he would play "dumb" and see if his students can help him come up with with the formula. But this is only the first step. They still need training wheels until the idea of slope and the formal formula come together in a meaningful way. 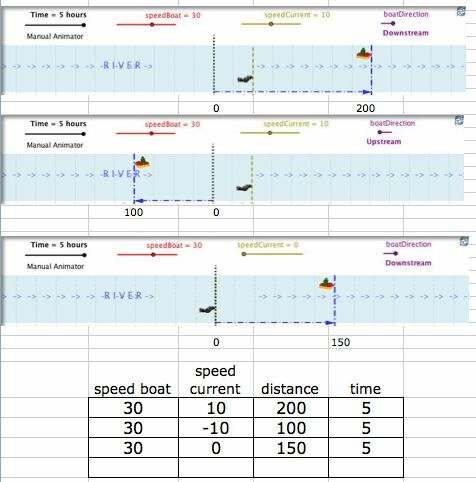 This can take a long time and students need to be reminded of the connection often before they can just fly with the formula. 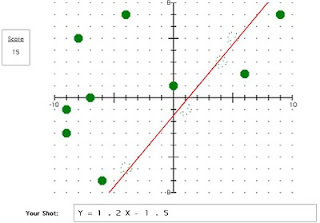 What is even more important for me is that if my students forget the formula they are able to recreate it from what they know about finding slopes from graphs. That means that the student really understand (or owns) that idea. That's all fine and dandy, but what if progress hasn't been made before the end of the class and the test is the next day? I would postpone the test, but if that's not possible. 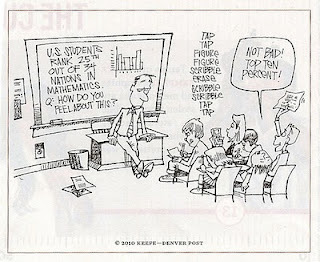 I would probably give away the formula since unlike the teacher in the comic above I don't have all day to wait for the eureka moment. There will be more teachable moments for me to try again. That's the best I can do. But in the long run I'm not optimistic that I can garner enough such moments to make a significant difference here. 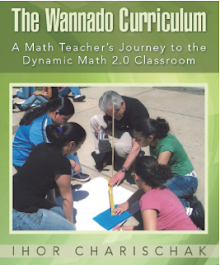 The challenge of finding all the natural paths is a tough haul for teachers if the overall trip is still the very scripted, but unnatural road to calculus. There is a better way to get there, but it requires a different way to look at things. We need to make he trip be intrinsically interesting. 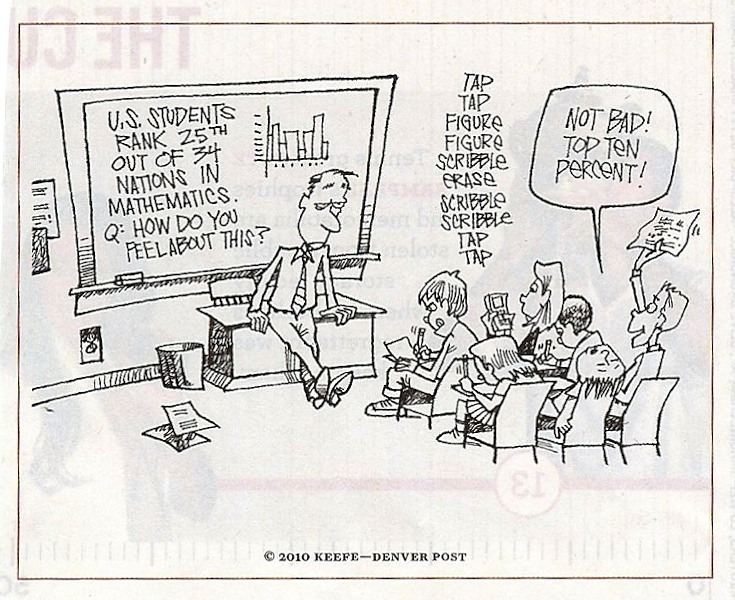 Sure, knowing it from memory helps but for students who desperately seek a formula to memorize (like the girl in the comic) I would work on a better way to scaffold it so the student sees the connection between the concrete (the graph) and abstract formula. 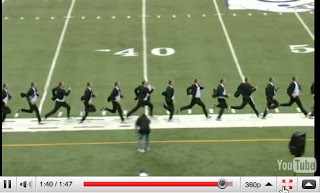 But this will always be an uphill unnatural effort. It requires something more than just a clever way to bridge the gap between the concrete and abstract. It needs a better context that gives students a reason to want to do it. The most effective context I found to get kids to “own” this concept and facility with the formula was after playing several rounds of Green Globs. The students learned the necessary skills not because they had to, but because they wanted to. 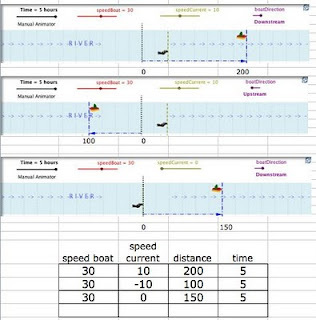 It was very useful for them to learn how to blow up more Globs with one linear function because they would get a higher point total and the reason that is so important more important is because in two weeks they would be competing in the Great Green Globs Contest. You see the more globs you can blow up with one line the more points you get. 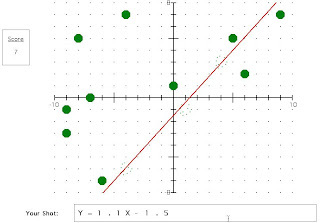 For example (figure 3) the function y=1.1x + 1 knocked out three globs for a total of 7 points. (1 +2 + 4). With just a slight change in the slope (figure 4) an additional glob goes down and you get score of 15 (1 + 2 + 4 + 8) points instead. The value of the glob doubles for each additional glob that is hit with one line. 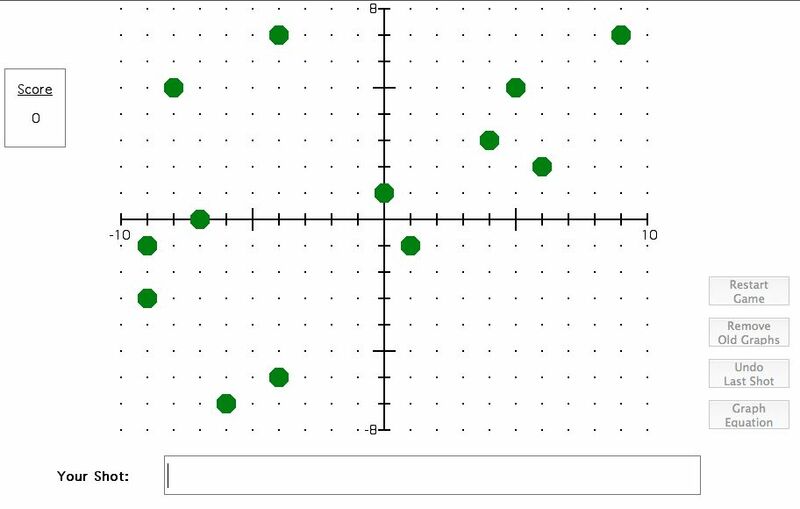 Understanding how Green Globs can inspire students to want to do math for its own sake is what makes finding the slope formula a very natural process and is at the heart of powerful learning. Take what happened to Guillermo an unmotivated 8th grade math student who was introduced to Globs by his teacher. 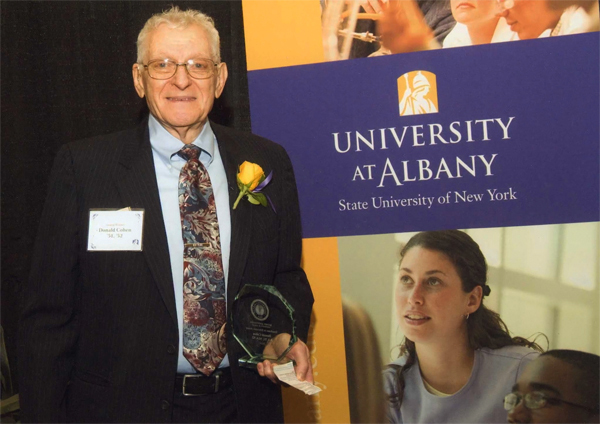 Using the slope formula was just the beginning for him. Once he discovered that you can also draw curves a whole new world opened up for him. Here is his report on how he handled an advanced Globs challenge. At one point I asked Guillermo how many points he would get if hit all the globs with one function. He thought about it. Then I added "I think there is formula you could use." to which he responded "I don't need a formula. I'll figure it out." I thought he would then proceed to add 1 + 2 + 4 + 8 + ... + 4096 using a brute force method. But instead he surprised me with this a couple of days later. (Watch the video below.) Check out his score at the end. Does Guillermo know the slope formula? I don't know for sure. But then who cares? He's miles ahead of that now. Math will never be the same for him. He will learn what he needs to know when he needs to know it. And that's what Math 2.0 is really all about. *George Lakoff and Rafael Nunez (Where Mathematics Comes From?) believe that all math can be learned intuitively even calculus if it is taught in way that connects previous learning with current new knowledge. 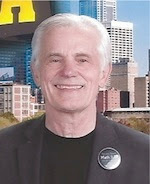 Keith Devlin doesn’t think that’s possible for subjects like calculus. 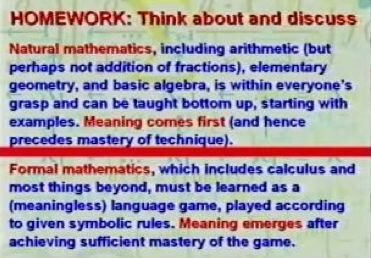 During his opening session presentation** at the NCTM conference in 2004, he said that there is some math that just needs to be learned “top down.” He poses this challenge to the audience. See my 3:40 min Globs intro video. Glance through the Great Green Globs Contest website. 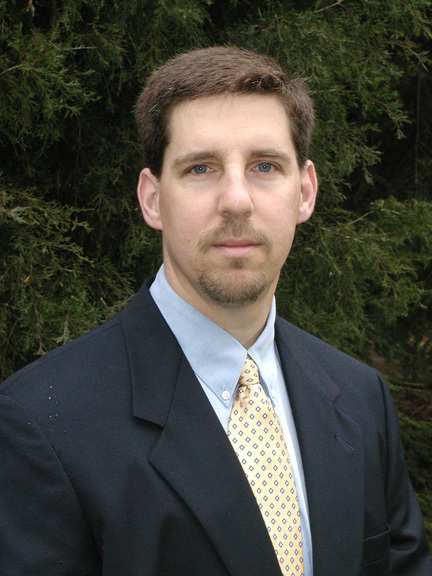 ** You will need to download Realplayer to watch Devlin's keynote opening session. His keynote begins at 18:15 in the video. 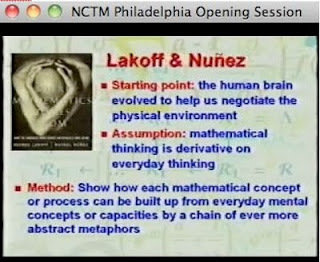 He starts talking about the Lakoff and Nunez book at 46:45. May 1, 2010. 12:45 EST. Hi there. I'm currently writing this as I'm flying home to White Plains, NY via Atlanta, GA. First time for me on a flight using Wifi. Very exciting! 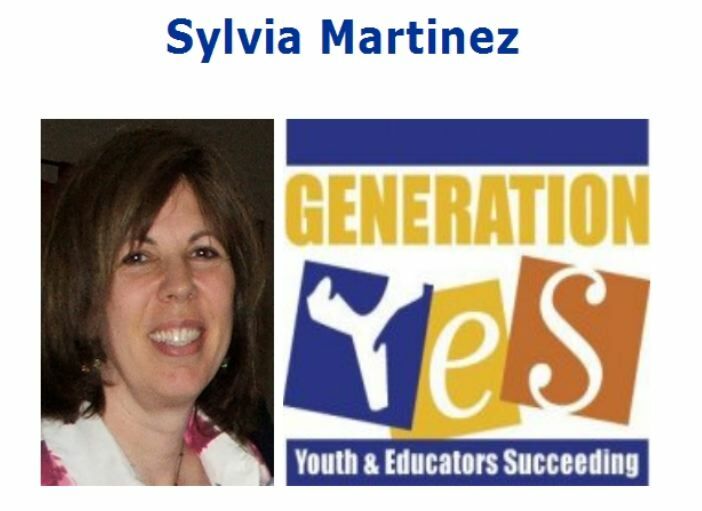 I'm inviting everyone who attended, participated in anyway or is interested in the NCSM and/or the NCTM meeting in San Diego to join our Elluminate session this Wednesday, May 5th, 6:30pm (EST). If you have a written about the conference in any form please share your URL with us - even if you can't make the Wednesday session. Early returns on where to find comments about the conference. 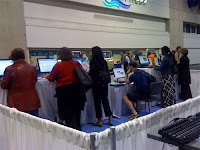 NCTM Conference Blog. Check that out. I've added a couple of entries myself.